If you read Gary Tuchman's blog post below, you'll know he was able to secure an interview with former Haitian leader Jean-Claude "Baby Doc" Duvalier. This all happened last Saturday in Port-au-Prince. In the video here, you'll get a look at the waiting game and ultimate frustration he experienced along with his producer, Justine Redman. I spent more than an hour this weekend with one of the Western Hemisphere's most infamous leaders. 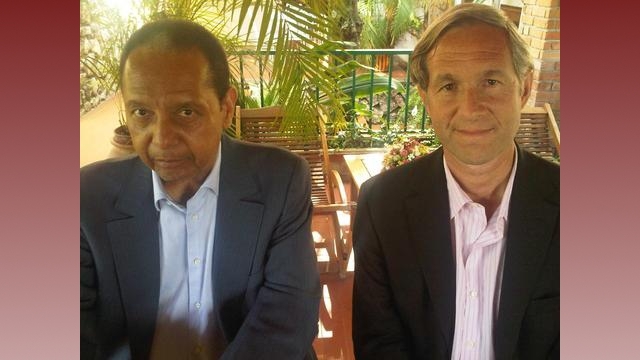 Jean Claude Duvalier is now back in Haiti after a quarter century in exile in France. The man known as Baby Doc ruled Haiti with impunity between 1971-1986 and made a dramatic return to Haiti this past January, a year after the devastating earthquake in the country. His father, known as Papa Doc, ruled the country with even more of an iron fist for the 14 years before that. Both men proclaimed themselves presidents for life. But while Papa Doc died in office, Baby Doc was driven out; after thousands of political opponents were allegedly killed or had disappeared during his reign. He was also accused of siphoning off tens of millions; if not hundreds of millions of dollars. He is now living in a friend's home with his companion Veronique Roy in on a mountaintop outside Port-au-Prince in one of Haiti's nicest neighborhoods. For months now, my producer Justine Redman and I have been trying to obtain an interview with Duvalier; to find out his side of the countless allegations against him. He hadn't done a television interview for many years. The timing was good when his attorney informed us Duvalier had consented to an interview with us. Not only would we get this important and exclusive interview, but we would also be covering that same weekend's inauguration of Haiti's new president Michel Martelly. We reported on the inauguration, and then drove to Duvalier's house. We were immediately struck by the fact that even though he is currently charged with corruption, theft, and misappropriation of funds, a police officer in a squad car sits in his driveway to offer him protection. We also saw at least two other security men in the house. I was introduced to the 59 year old leader and immediately was struck by how infirm he looked. It is especially noticeable because when he took over his country at the age of 19 (he was the youngest leader in the world at that time) he looked every bit a teenager. But four decades later, he had a hard time moving his head, and his speech was very slow and stilted. He was also extremely soft spoken. All in all, one would never imagine based on his appearance if they didn't know his past, that he has had such horrific allegations against him. His companion Veronique Roy, who met him in France in 1991 after he divorced his wife, (she said when she was introduced to the president she thought he was a president of a company) offered us soft drinks and water. They were both very friendly as our cameraman Sarmad Qaseera prepared to set up his equipment for our interview. Duvalier wanted to know what questions I was going to ask him. I explained we don't give out our questions to people we interview, but explained in general we wanted to ask him about his life as Haiti's ruler, what his life was like in exile, why he came back to Haiti, and his response to the gamut of allegations against him. Before the cameras were ready to roll, he told me in French (which my producer translated) that he wanted to come back because he missed Haiti very much. He said he learned about the details of the earthquake from watching CNN in France, and that he couldn't believe how much damage still existed 16 months later. As we talked he had four cellphones in front of him, glancing at them, texting on at least two of them, but not answering them when they occasionally rang. When the time had come to set up our camera, Duvalier looked at his lawyer and said "I thought this was just going to be a first casual meeting." Apparently, Duvalier wanted to meet me, gauge me, and then decide if he wanted to talk on camera at a later date. There was no luck changing his mind on this night. Duvalier and Veronique Roy said they had plans and had to leave the house. I told them we could do the on camera interview the next day. Roy said she would call us later that night with the time for the next day's interview. Duvalier also told my producer Justine he would personally call her. Well, the call never came. Duvalier's attorney said to us that after we left, Duvalier and Roy told him they wanted to do the interview, so even he didn't understand what happened. He gave us Duvalier's personal cell number. No answer. The lawyer tried calling. No answer. So the next day, we drove back to the house. Duvalier's aides said he wasn't home. But we had a feeling, based on all the security people we could see, that they were not telling the truth. We left the house and told them we would come back later in the day. After we left, my cellphone rang; it was another Duvalier aide, who said Duvalier had an "emergency," but that I would definitely be called back with a time for the interview. That call never came. We went back to the house to give it one more try before we left the country. His aides were as unhelpful as they could be. 24 hours earlier, we were honored guests in the Duvalier home; we even played with their dog. But now, we were being treated not quite as well as that dog. We aren't sure Jean Claude Duvalier was even aware we came back for the interview. We never got back in touch with him. But common sense tells you, his aides wouldn't have been so unhelpful and unpleasant without the okay of the man who used to rule their country, but now only rules them.